Handling cash is time-consuming, risky and full of opportunities for human error or theft, if proper controls are not in place and adhered to. You or your managers spend time each day counting cash and preparing your business’ bank deposits. When there is an error, time is spent determining where the error occurred, and business owners have to determine if this error is an honest mistake or a result of theft. Installing an electronic smart safe in your business location takes a lot of the guess work out of the equation. As the business owner you can have real time visibility of cash deposits in a variety of ways, such as user, shift, business day, and more. Please contact us if you are interested and would like more information on how a smart safe solution can help your business. 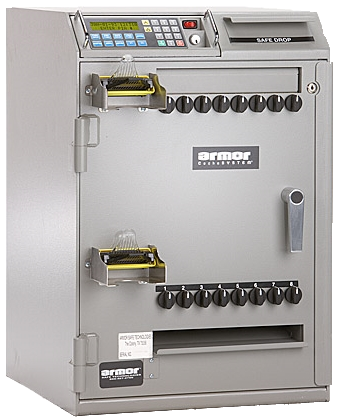 Fortress Armored is an authorized dealer of Armor Safe Technologies.